I continue to be interested in making shoes. It’d be nice to make welted leather shoes (and I hope to eventually, since my everyday shoes are close to being completely worn out), but they require a lot of specialized tools (see the shoe-making Reddit community for more info). So I thought I’d start with an easier task: making felt slippers! 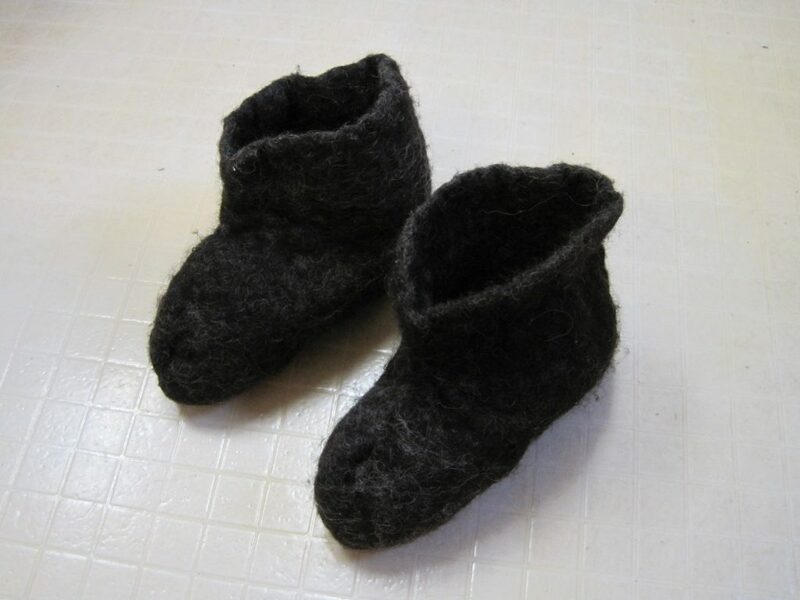 If they turn out well, I may want to make felt shoes also (like Russian valenki, traditional felt boots). 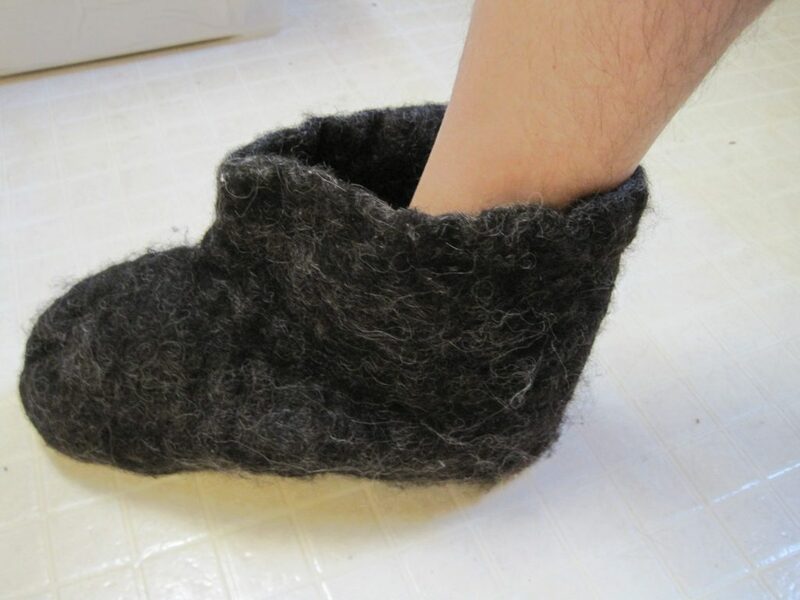 I followed the directions in this tutorial, in addition to watching lots of Youtube videos (Christi Dea makes felt slippers and shoes, and does other weird fiber art). 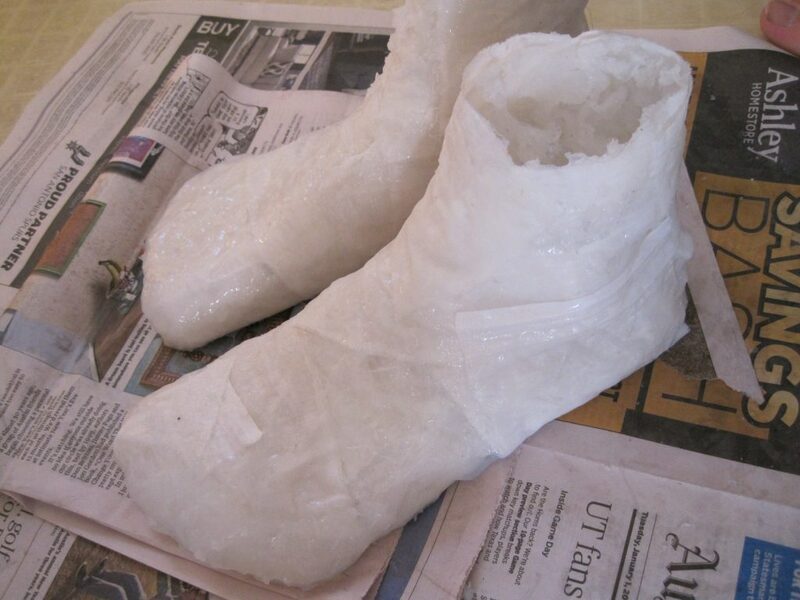 Make a bubble wrap template by tracing your foot + allowance for shrinkage, and adding the desired ankle height. 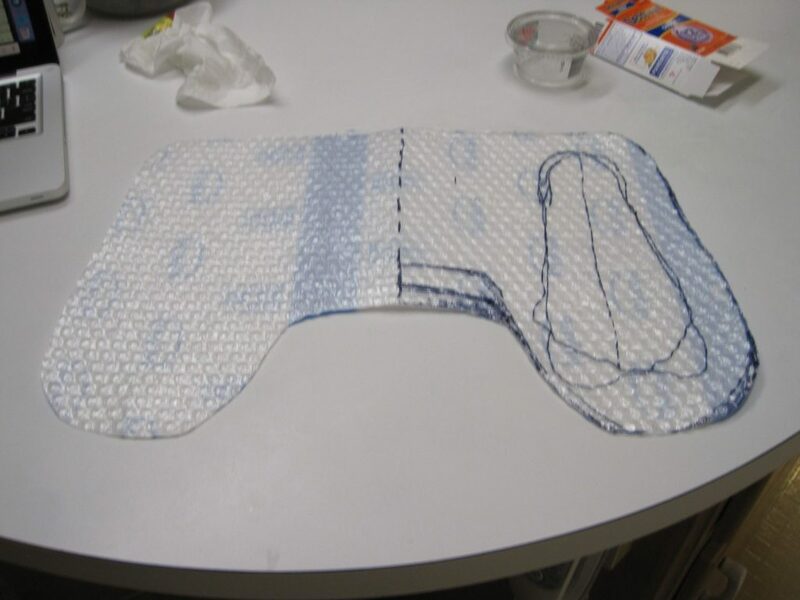 Fold the bubble wrap in half so that you get an attached, double template. Gather all your wool! I used brown and gray Shetland wool that I bought from another spinner on Craigslist. 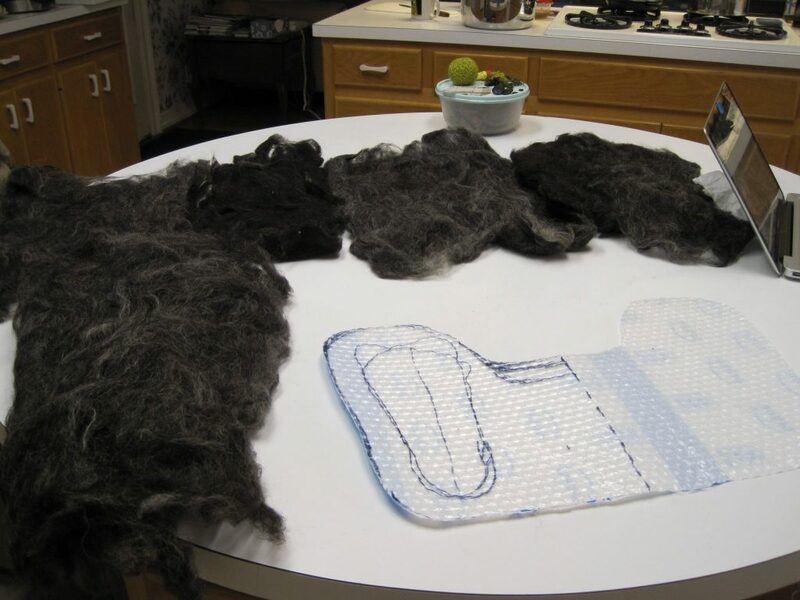 According to the above tutorial, you will need about 500 grams (1+ lb) of wool, loose, roving, or batts are all fine. 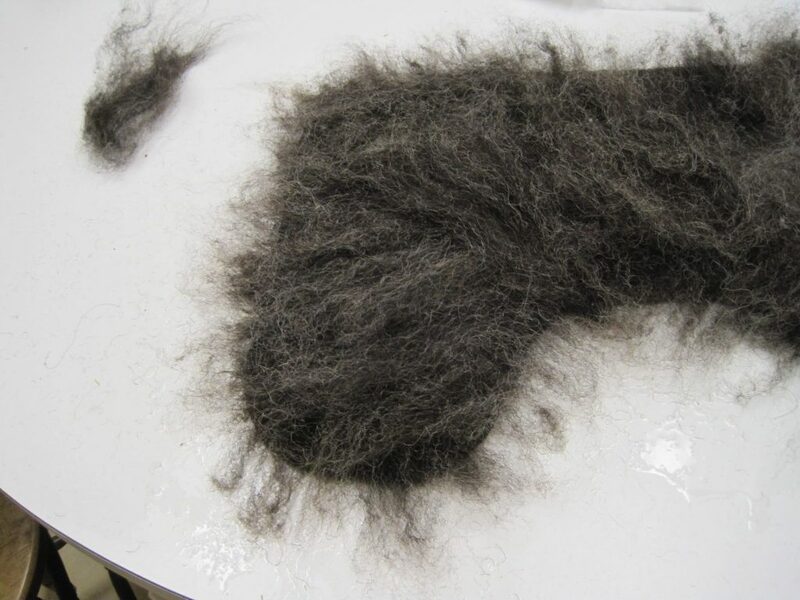 Then you layer wool and felt it a little bit, just enough to hold together. Then you full (fulling is the origin of the common last names Walker, Tucker, and Fuller!) it to shrink and harden the felt. It takes a loooooong time to do this by hand. I also put my booties through the washer and dryer, but they need to be shrunk further. They are very voluminous at the moment. The instructions I followed incorporated a tongue into their shoes, so I was led to add extra space around the ankle. As you can see, this was a mistake. Hopefully I can shrink all the extra down to fit, or design a tie/button system to take up the excess. I’m aiming for slip-ons or easy-tie shoes. They still need to be filled to be made solid. So this project is very much in progress. I’ll update y’all once I get more done!